What are you waiting for? Register before April 30th ! The 2nd BeYoung! Beyond! 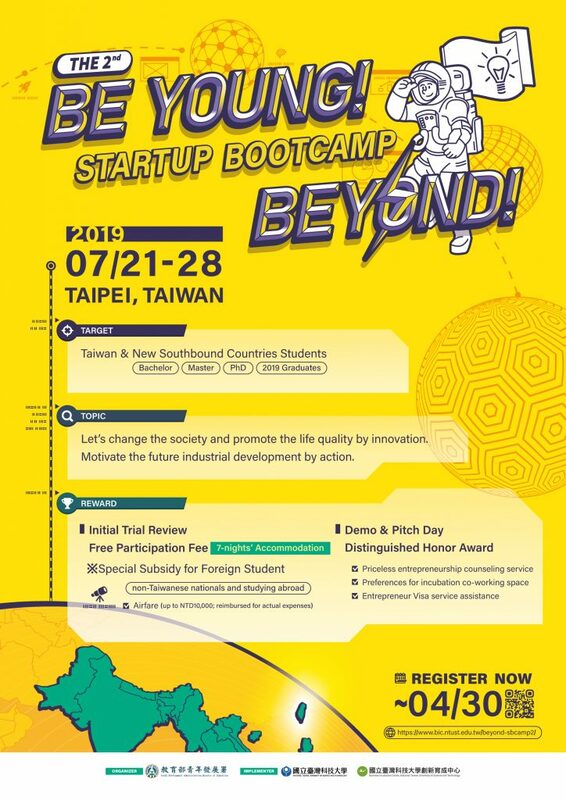 Startup Bootcamp would be held at National Taiwan University of Science and Technology (NTUST), Taipei, Taiwan, on July 21th-28th, 2019.On-line application is now open! Welcome the colleges or universities students(Bachelor, Master, PhD, 2019 Graduates) who are interested in the innovative entrepreneurship (area not limited) to apply. The student accepted in the initial trial can participate in this bootcamp for free and will be provided 7-nights’ accommodation during the activity. For the accepted foreign student, the organizer will offer the round-trip economic class airfare (Up toNT$10,000 which needs to be reimbursed for actual expenses additionally). For more details, please find the Registration page. Welcome to “The 2nd Be Young! Beyond! Startup Bootcamp”.